4 Bedroom, waterfront cabin with private dock and access to McWain Pond. BOOKING now in SEPTEMBER OF 2018! This beautiful Maine cabin has been a treasured vacation retreat for many years. The property has a private dock and floating dock to swim, fish or boat from. This spacious, two level cabin can accommodate up to six visitors comfortably. There are four bedrooms that include 1 double bed, 4 twin beds and 1 futon. Wake up every morning to the peaceful sound of the loons and beautiful tree-lined water views. Available for use is a 1 person kayak and row boat (no motor). During the day, relax on the deck that faces McWain Pond or roast marshmallows in the fire pit on cooler summer evenings. McWain pond spans just over 2 acres with a maximum depth of 42 feet. It is known as a great fishing spot with a nice variety of fish. Small mouth bass, pickerel and rainbow smelt just to name a few. toilet, shower, Please bring own towels. Coffee maker, uses regular ground coffee. Not a Kureig. 4 life jackets and 1 child size life jacket. 1 swimming tube. Waterford Maine is conveniently located in the Lakes Region of Maine. Only 10 minutes for Norway Maine. Enjoy the Norway Brewing Company for dinner and local handcrafted beer. Swim or boat on Lake Pennesswasse, Norway's largest lake. 1. Jettison the hold harmless clause from the rental agreement. It is distasteful and unenforceable. 2. Describe the lake. "Pond" implies small. Had I known it was so big, I would have brought my own motor for the boat. 3. Needs at least a few window A/C's for very hot days. 4. Single bathroom downstairs inconvenient. 5. Needs full size coffee pot. 6. Wood for fire pit should be provided. 7. Supplying our own bedding was inconvenient. We found the place very nice, clean, and comfortable. The lake setting was beautiful. The 4/5 stars reflects the noise level of the renovation work at the property next door, which we had to endure for the week of our stay. The children's camp across the cove was also at a noise level requiring some getting used to, but not as obnoxious as the work next door. Otherwise, it was a great place. What a wonderful week we spent at Mcwain Pond! It was very private and secluded and yet very close to anywhere we needed/wanted to go. The swimming was great,with a sandy bottom and an awesome dock to sit on and enjoy the beautiful sunsets! The fire pit area was awesome and close to the water. The house was well equipped and very comfortable. It was unusually cold for August when we were there, and the electric heat was very welcome! The row boat was great to have available and the fishing was excellent! We will definitely consider staying here again! We had so much fun on the pond, the kids did not want to leave. 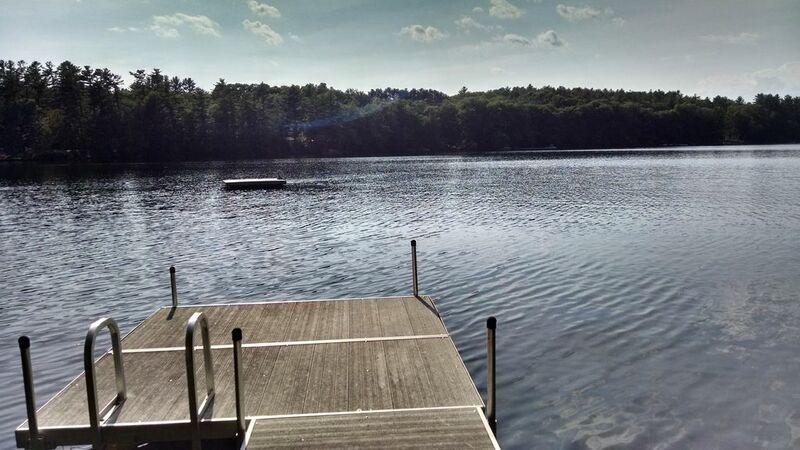 Maine is beautiful and McWain Pond is a beautiful lake alongside a beautiful setting. The scenery is amazing. The location is for folks who like peace and relaxation. We spent a week visiting family during a family reunion and it was perfect. Waterford, Maine is located in the beautiful Lakes Region of Oxford Hills Maine. The cabin is located on peaceful McWain Pond, a stones throw away from Keoka Lake. Kayaking, canoeing, swimming, hiking and fishing are some of the most desired activities to do during your trip to this area. Neighboring towns to visit include Oxford, home to the new Oxford Casino, Bridgton, Naples, Norway and you are an hour outside of Portland. For outlet shopping, Waterford is only 34 miles from North Conway, New Hampshire. Lease agreement will be provided via email prior to check in by Bisco Property Management.